The Half Fast Cook is having grilled Panini sandwiches made on the standard little George Foreman grill tonight. Yes. You can make paninis on the GF instead going out and buying a panini press which is expensive and just one more kitchen appliance that probably won't fit in the cabinets. I had my first panini in New York City. Yum. But, those paninis are expensive and even the cheap frozen ones at the grocery store kind of make you step back and say, "Ouch." We're talking a sandwich. Buy some bread, meat, and cheese, and you can eat all week for the price of a pre-made panini. Lord, I think I'm channeling my mother again. She washes out the zip lock bags. 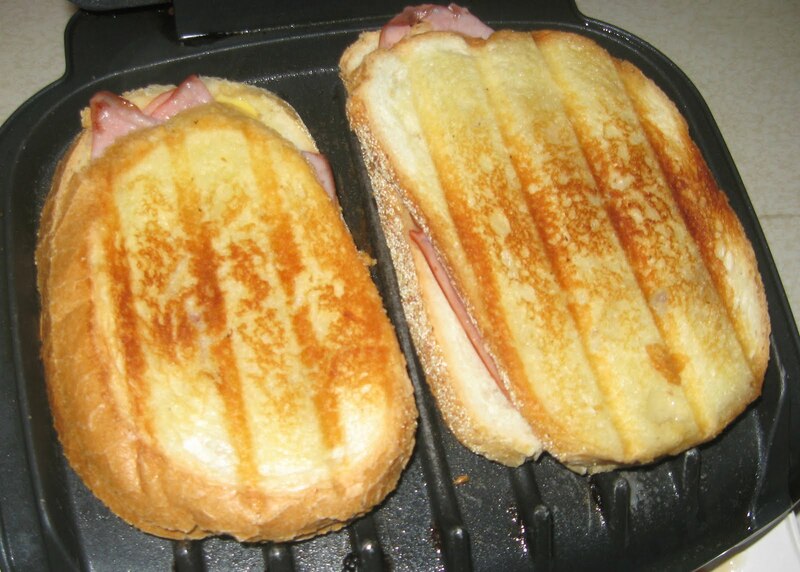 Since I thought that restaurant panini was so rocking good, I decided I needed some way to make paninis at home. The George Foreman was sitting there on the cabinet, and I figured it was a press grill so was a similar concept. You're really just looking at a grilled sandwich but cooked from the top and bottom at the same time instead of putting the sandwich in a skillet and flipping it. 1. Get some sturdy bread - not the soft Bunny bread that tears easily. You want something with substance, since the bread bears the weight. We don't have loads of choices on bread here, so I usually buy a loaf of crusty French bread and just slice it thick myself. 2. Butter two slices of bread - just the sides that will come in contact with the George Foreman grill. You would think that would go without saying, but trust me when I say it needs to be said. People email me their kitchen mistakes. Bless them. It helps me help you. 3. Put a slice of bread buttered side down on the George Foreman indoor grill and add meat/cheese (or whatever you want) and top with the other buttered slice of bread butter up toward the top plate press. 4. Close the lid on the George Foreman and let the sandwich grill for a few minutes. The time can vary depending on the specific model (and some adjust on the temps), but my standard little George Foreman runs about 3 to 4 minutes for a fairly crispy toast on the bread. I like my really dark to be honest, but I held myself back for the photo. That's the Half Fast way to have yummy panini sandwiches at home without having to buy a panini press and without paying through the nose. My favorite panini is egg salad. Yes. I kid you not. It sounds kind of gross, but I had one years ago done in a skillet, and it's like the breakfast sandwich from heaven. Just mix up some egg salad. Then, don't spread it on too thick. A little goes a long way and mashes out the sides if you overdo it. That's my kitchen secret of the day. Make yourself a panini and think about trying out the egg salad panini.